Publish your Paper - computer science & IT Journal? Dear sir, I am extremely overwhelmed with the published paper of mine. Thank you for publishing it in a little soan of time. Regards, P. Renuka, student of MBA, JNTUH College of hyderabad. Dear editor, I wish to express my profound gratitude to you and the Editorial Board for a job well-done. This is superb for having my paper published on time. Keep soaring higher. Once again thank you. From AKINBOHUN FOLAKE, Rufus Giwa Polytechnic, Owo, Ondo State,Nigeria. Thank you Sir. We are very thankful to you for your response. 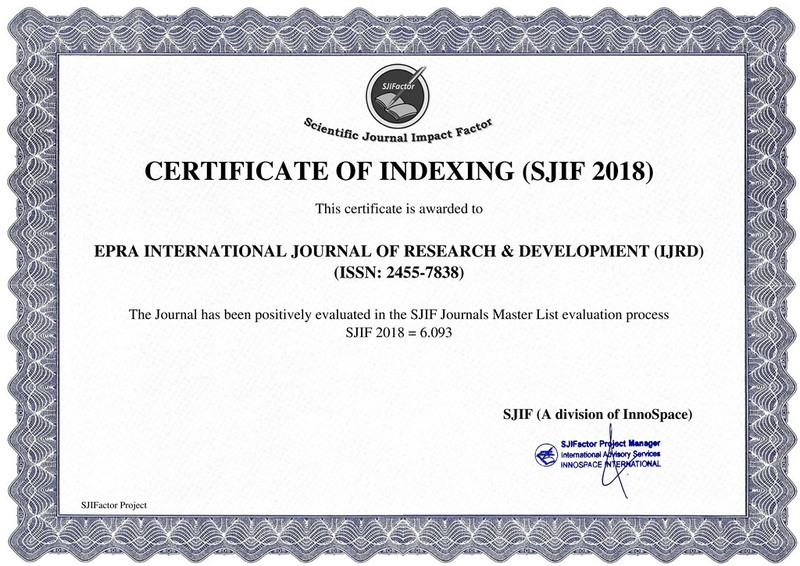 Thanks for publish in we are your reputed EPRA IJMR journal. Best Regards. Muhammed ,Department of Physical Geography , Nevşehir Hacı Bektaş Veli University, Turkey. Thanks for publishing my article in your reputed EPRA- IJRD journal. I am really happy with quick & professional services. I must say that EPRA understands & put the value of real hard work of any researcher by the publication without delay. Also,I am working on another article to publish in IJMR. Thanks to the Editor in chief & whole team-Regards, Swapan Banerjee, Department of Nutrition, Seacom Skills University.11, Kendua Main Road, Kolkata -700084.West Bengal. Respected Editor, I extend special appreciation for publishing my article in your esteemed journal.I hope to maintain this upward momentum with quality articles in future as well.Please extend my thanks to everyone involved. Regards, SANTOSH Research Scholar, HP University, Himachal Pradesh,India. 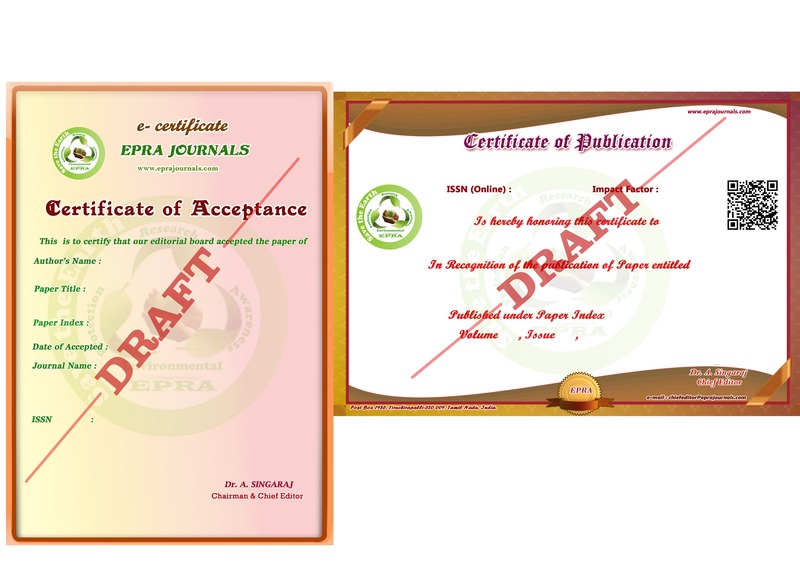 Dear editor sir I am very much happy to see my paper published in your epra-ijrd journals and I express my sincere thanks to each and every member of epra ijrd team.i wish to continue this relation in future. Regards, Chikkavarapu Gnanendra Rao Assistant Professor of mathematics, Department S&H, SSIET, Nuzvid, Andhra Pradesh, India. Dear Sir My sincere appreciation to the EPRA team for publishing my paper in IJMR on a short duration after due diligence and accuracy. Your professional approach towards publishing article is mind-blowing. Wish to continue your efforts to help more aspirants in the field of research- Madhu.T, Administrative Officer, MIMS College of Nursing, Malappuram, Kerala. Dear sir, I am so thankful to the editor for publishing the digital copy of my article, “COMMUNITY DRAMATURGY IN THE PERFORMANCE OF THE DRAUPADI FESTIVAL”. I was pleased to see the article has been published in your reputed journal. The design and pattern of the publication is always well organised. I extend my special thanks for organising the layout of the paper. It looks professional. I will share your publication details with many writing friends, in research networks, such as, academia.com and researchgate. Your selection process is very keen and qualified. Thanking you so much for encouraging scholars. Pejjai Nagaraju, Research Scholar, Department of Theatre Arts, University of Hyderabad. Dear Editor, We hope that this email finds you well. We are really glad to have our accepted paper published on due date. Thus, would you accept our sincere gratitude and respect to you and your great job! Thank You ! Looking Forward to Publishing With You Again, Best Regards, Sofiane Mammeri, Assistant Professor of Linguistics, Department of English, University of Bejaia, Algeria. I sincerely appreciate the effort of members of the review and editorial board and infact the entire management team of the journal for prompt response to all correspondences. I want also to appreciate you in the professional way you handled publications, am very impressed, I will also commend you on the price for publication, its cheap for us coming up researcher. Keep it up. Thank You. Mr. Ifediora, Christian Osita, Caritas University Amorji-Nike Emene, Enugu State, Nigeria. Dear Sir, Thanks a lot for fast process in publishing our research paper. Regards, Harish Kumar, Special Educator , All India Institute of Speech and Hearing, Mysore-570006 and Research Scholar, RIE (NCERT), Mysore, Karnataka, India. Dear Sir/Madam. I would like to thank EPRA journal and Editors and Administrators for publishing our papers in a short period of time. Intimation regarding our paper is excellent and I never received responses like your Journal and payment mode is easy one. and also I suggest my friends to publish papers in our EPRA Journal. I thank once again. Dhanasekaran P, Research scholar, School of Commece, Bharathiar University, Coimbatore, Tamilnadu, India. Dear Sir/Mam Thanks for publishing my manuscript in EPRA journals. I appreciate fast and reviewing and publication process, thanks so much for the efforts for that. Ashraf El.Dakhly, Researcher in Dept. of Rinder pest research vaccine, Serum and Vaccine Research Institute, Abbasia, Cairo, Egypt. Dear Sir/Madam, I would like to express our gratitude to the entire team of EPRA Journals for publishing our paper in your reputed online journal. We really appreciate your services.Thanks to all entities that played part, from the submission stage to the publishing stage. Regards, Francis A. Ruambo, Department of Information and Communication Technology, Mbeya University of Science and Technology, Mbeya, Tanzania. Respected Sir/madam I would like to express my sincere gratitude and happiness to you for publishing my paper in your esteemed journal. I am thanking you that you had given me an opportunity to express my ideas and also for your assistance and support to publish my paper. By FARSEENA MOL.P, M COM student , P S M O College Thirurangadi, Malappuram, Kerala. Once the paper published effectively then EPRA Journals not acknowledge any solicitation identified with changes of paper content or Authors Details. According to our standards maximum 3 authors only will be took into account for single paper. EPRA Journals consider author names in the article are got the permission from respective authors by the submitted author. If corresponding author wants to remove any one Co-author name from their submitted article. He/she must communicate the editor or chief editor before 15 days from publication date. EPRA journals will not consider any paper or component of a paper that has been published or is under consideration for publication elsewhere. We never tolerate plagiarism. In case any article is found to be plagiarised before publication, we immediately reject the article and blacklist their name. Even after publication if any article found plagiarised or reported by anybody with proper evidence. We will REMOVE the article without any notice to the corresponding author. Refund also available when we delay the publication in more than 15 days from said publication date of the journal.This is applicable to paid papers only. There is no refunds to plagiarism complaints/copy right complaints. We won't wilfully unveil your individual data to any outsider or organizations unless required by law. We treat this information as private and confidential. EPRA Journals may utilize your personal identifiable data just for your article publication purpose. We utilize IP locations to dissect patterns, regulate the site, track client visits to our site, and accumulate wide demographic data for total utilization. IP locations are not connected to personal identifiable data. This Web website contains connections to different sites. If it’s not too much trouble make a special effort to be mindful that we are not responsible of the security practices of such different sites. If editor or chief editor find out particular paper is not suitable for publication in later stage, article acceptance will concelled and refund the entire fee into the same paid author account. It will be credited within 7-15 working days. Refund also available when we delay the publication in more than 15 days from said publication date of the journal.This is applicable to paid authors only. We won't give Hardcopy of the certificate and published article to Online edition paid authors. Our aim is speed and safe delivery. So we are sending the hard copies (in case of print journals) and publication certificate (in case of print journals) through Speed /Registered Post or familiar courier service. This decision is based on destination availability, distance and delivery place. We will ship the hard copies (in case of print journals) and publication certificates in case of print journals) within five working days from the publication date of respective journal.